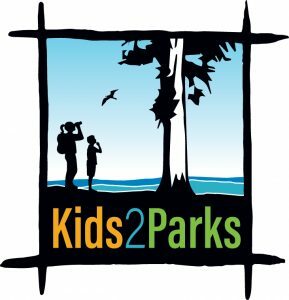 Kids2Parks is an innovative park-equity program to bring students from Title 1 schools on State Parks field trips. The program, a partnership between California State Parks and Friends of Santa Cruz State Parks, increases the number of students who have visited a state park or beach by reducing barriers to access. The program offers field trips to select Title 1 schools in Santa Cruz, San Mateo and Santa Clara counties. Find out if your school is eligible for free bus transportation to a field trip! Applications are accepted once a year for transportation. Teachers may apply for as many field trips as they are eligible for, but will only be selected for up to one trip. Field trips will be scheduled by State Parks staff for the 2019/20 academic year based on availability. Teachers/schools are responsible for arranging transportation to the park. A limited amount of funding is available to cover transportation costs. The 2019/20 Kids2Parks application window will be April 1-30. Online registration opens at 10 a.m. on Monday, April 1. Teachers will receive a response from State Parks about the status of their application by May 15. Field trip description: Visit the gateway to the Santa Cruz Mountains. Park trails provide access to many distinct rock outcroppings where delicately sculpted lace-like patterns, pockets and caves all present themselves in the 20 million-year-old Vaqueros Sandstone. Once an important trade location for the Ohlone Native Americans, the lush feather moss, Black Oak groves and expansive views offer an immersive cultural and natural experience. Typical school group hikes are about 1 mile long with multiple educational stops along the way. Eligible schools: Select San Jose-area Title 1 elementary schools. Check school list. Field trip description: A visit to the Castro Adobe in Watsonville immerses students in our community’s story from the heyday of the vaquero to the aftermath of the Loma Prieta earthquake. Hands-on, sensory experiences bring more than a century of history to life, while guided investigations of students’ own inquiries make learning personally relevant. You don’t need to leave the Pájaro Valley to touch a real adobe and connect with California’s colorful past. Curriculum: Bilingual curriculum that supports this field trip is available. The lessons are appropriate for all grade levels but are ideal for 3rd grade (local history) and 4th grade (California history). Eligible schools: Title 1 schools in the Pajaro Valley Unified School District. Check school list. Field trip description: Students will visit the beaches of Half Moon Bay State Beach and learn about the many birds and ocean creatures that inhabit the diverse, interconnected ecosystems of the coast. Eligible schools: Select Title 1 schools from San Mateo County. Check school list. Field trip description: A visit to Henry Cowell Redwoods in Felton immerses students in an old-growth redwood forest. Discover the tallest living organisms on earth, search for banana slugs, and even step inside the famous Fremont Tree. The largest tree in the park is approximately 277 feet tall and about 1,500 years old. Eligible schools: Select Title 1 schools from Santa Clara and Santa Cruz Counties. Check school list. Field trip description: The interactive program begins with a tidepool introduction in the visitor center, followed by a guided walk and an exploration of the rocky intertidal zone. This field trip is available in the spring each year and is appropriate for all elementary school students. Eligible schools: Select Title 1 schools from Santa Cruz County. Check school list. 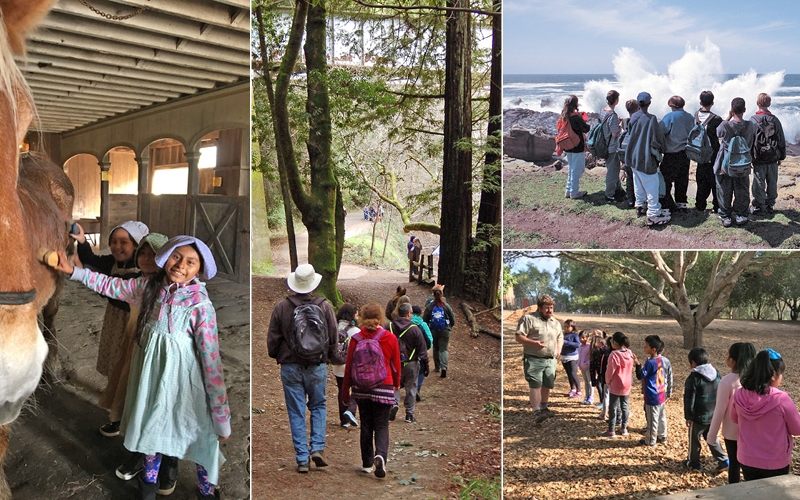 Field trip description: Students journey through the seven distinct habitats at the coastal end of Big Basin Redwoods State Park. While hiking scenic trails we will compare and contrast different ecosystems firsthand through plant and animal observations and inquiry. The day includes moderate hiking of up to 3 miles, observing native reptiles and/or amphibians and exploring our cutting-edge Nature & History Center. Eligible schools: Select Title 1 schools from Santa Cruz and San Mateo Counties. Check school list. Field trip description: Seacliff State Beach has a secret that is 2.5 to 5 million years old. The secret? The land from Santa Cruz to Bakersfield was once covered by an ocean. On your visit, discover the layers of fossils that we can see in the cliffs along Seacliff State Beach and the remnants of the creatures that once lived in this shallow sea. Field trip description: This trip is a slug-paced stroll thru the redwoods. Students will discover redwood ecology and learn about the forest habitat. They will learn about the logging history of the park and may see pieces of history as they walk the trails. Field trip description: Ranch Kids Days is an intensive all-day environmental studies program involving hands-on activities for 3rd grade classes. Travel back in time to the early 1900s to find out what it would be like to live on a coastal dairy farm. Students dress in period costume as they learn to help run the ranch by participating in hands-on activities just as the families of the dairy farm did 120 years ago. Activities may include wagon rides, preparing period meals, forging metal in the blacksmith shop, old-fashioned laundry processes, animal care, gardening, vintage games, crafts, journals, music and stories. Eligible schools: Select Title 1 schools from Santa Cruz County; 3rd grade classes only. Check school list. Note: There is a limited amount of field trips to Wilder Ranch. An alternate field trip with similar experiences and learning objectives is Castro Adobe State Historic Park.